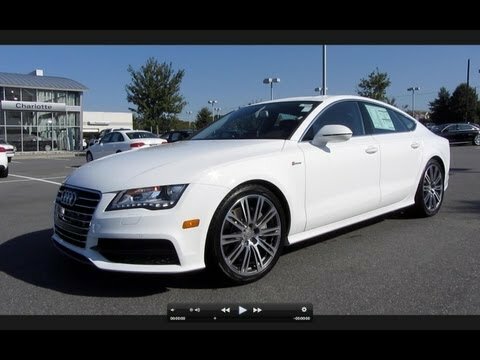 Audi's A7 made its debut for the 2012 model year and is the latest luxury liner to be dubbed a "4-door coupe." The A7 is actually a cargo-swallowing hatchback that stands out in this class with gorgeous styling, a supple interior, a powerful-yet-relatively-efficient supercharged V6 and standard all-wheel-drive. Excellent performance! And a really attractive body style. No problems. Best car I have ever had. Easy to drive, and fun also. Handles exceptionally well. I drove many cars and none were as much fun to drive as my Audi. It is fast and I just have the regular engine and it also holds the road very well. It always ranks above the competition in most of the reviews in car magazines. It's an All Wheel Drive car that is safe, dependable and will get you to your destination in style. It's a luxury car that is very smooth and dependable. The repairs if any do cost an arm and leg but you do get what you paid for. It's all wheel drive and in Michigan winters, you need a good car to drive in that is safe and that's how I feel is safe. It's also an eye catcher and people love the look of the car as do I. It is a head turner because there is nothing else out there like it. It is very reliable. You get what you pay for and it was worth every penny. I wish the price was a little lower at the time but it was still worth it. The quality of the vehicle is very high! No complaints.